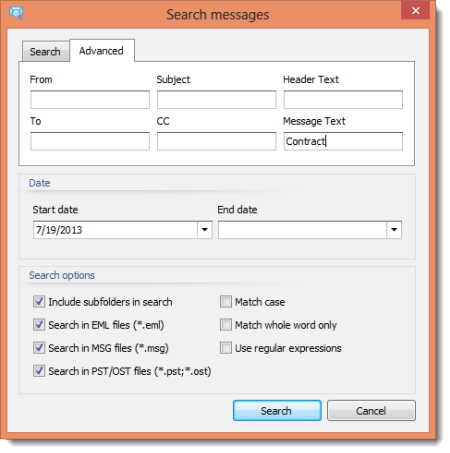 .Msg Viewer | MsgViewer Pro Outlook e-mail viewer. Search, print, view, index and convert emails to PDF. 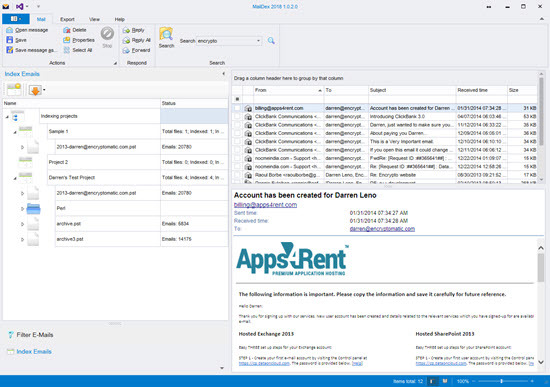 Since 2006, MailDex by Encryptomatic LLC has been helping Microsoft Windows users manage their email content. When Outlook emails are saved outside of Outlook's .pst file, they are converted into individual .msg email files. MailDex can manage large quantities of .msg files. If you have thousands of .msg emails in recursive directories, MailDex will load them all into a single list from which you can filter, search, and batch convert to PDF, MBOX, CSV, EML and many other useful formats. In addition to .msg files, you can now manage other email formats, including emails stored as .eml, mbox, .mht, files, as well as Outlook .pst and .ost files. MailDexis really six email viewers in one! MailDex is the most accurate email viewer for .msg files outside of Outlook itself. It can render text, html, and complex rich text formatted .msg files that have Outlook SmartArt and embeded graphics. Hundreds of non-standard .msg email formatting examples have been included, making MailDex extremely accurate. You'll appreciate MailDex's powerful rendering engine while converting .msg files into .pdf format. Convert Outlook .msg files, individually or in bulk, to different formats, including Mbox (Thunderbird), .EML, .MHT, HTML, Text, DOCx, ODT, CSV (Excel), JPG, GIF, TIF, PNG, and PDF. Bulk extract email file attachments directly from emails and save them a folder. For email archiving, MailDex supports PDF/A, an ISO standard approved for long term storage for electronic mail. While exporting email to pdf format, you can choose how MailDex should handle your file attachments. Options include extracting them to a disk folder, embedding them within the PDF, or converting many different document types directly to the PDF image. You can export emails to individual pdf files, or covert multiple emails into a single PDF. With MailDex you can setup and apply a specific file name sequence. Apply file names sequentially with letter and number combinations, or use parts of the emails, such as subject, sender email, receipient, etc. You can even combine different parts to create a custom naming structure. MailDex is well suited to application sharing environments, such as Citrix. Command line options allow system administrators to control the user interface by disabling the features of MailDex. For example, if you want your users to be able to browse a directory of .msg files, but not to print or copy, you can disable those features. Learn more about MailDex's command line options. With MailDex, you can search your a directory of .msg files, then reply to or forward messages using your favorite desktop email client. MailDex's user interface can be customized by commandline settings, allowing administrators to remove unnecessary product features or menu items. Click here for the full list of MailDex's features. Contact our sales department if you have a special request or requirement. For example, if you are interested in licensing this viewer for re-distribution, require a site license, or have a special development need, we would like to discuss it with you. 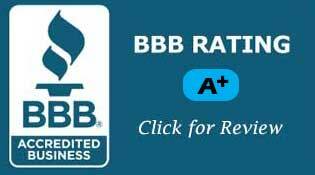 For a prompt response, please email: sales at encryptomatic.com, or phone us: +1-651-815-4902 x1. What is a .MSG file?